The Cunniff-Dixon Foundation in collaboration with the Hastings Center and the Duke Institute on Care at the End of Life just announced it will now be accepting nominations for the third Annual Hastings Center Cunniff-Dixon Physician Awards. The goal of this one of a kind award is to encourage excellent end-of-life care by giving physicians national recognition for their clinical contributions and commitment to the cause of end-of-life medical care. The 2012 award prizes tops off at $95,000. There will be two unrestricted $25,000 prizes for senior and mid-career physician who demonstrate, through leadership and practice, a serious commitment to end-of-life care. Another three unrestricted awards of $15,000 each will go to physicians early in their careers (less than 7 years in practice) who have made a valuable contribution, through practical research or clinical work, in the field of end-of-life medicine. As a 2011 award winner, I cannot understate the importance of the award from a professional development standpoint, as well as its importance in highlighting the efforts of the entire palliative care team to both institutional and community stakeholders. It was also inspiring to meet the Cunniff-Dixon foundation’s founder, Andrew Baxter, as well as Dr. Robert Martensen (who among his other accomplishments is also the director of the National Institutes of Health Office of History). To see some of the award ceremonies from last year, click on the following video. 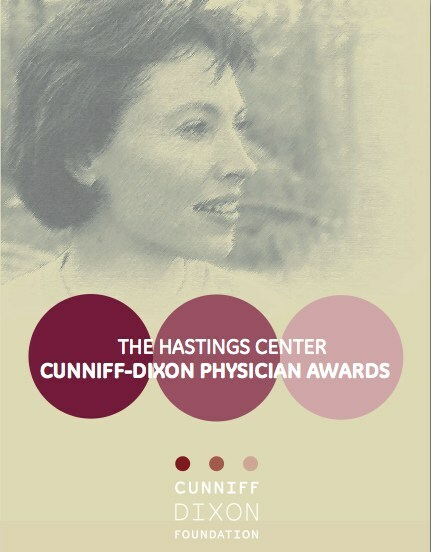 Nominations will be accepted through September 30, 2011, and all nominees must be licensed physicians practicing in the United States. Any individual or group, including professional associates, patients, and families, can submit nominations (the nomination that led to my 2011 award was submitted by the brother of a deceased veteran that was cared for in our hospice unit). To either download a nomination form or a brochure, please go to the Hastings Center Website or the Cunniff-Dixon website.